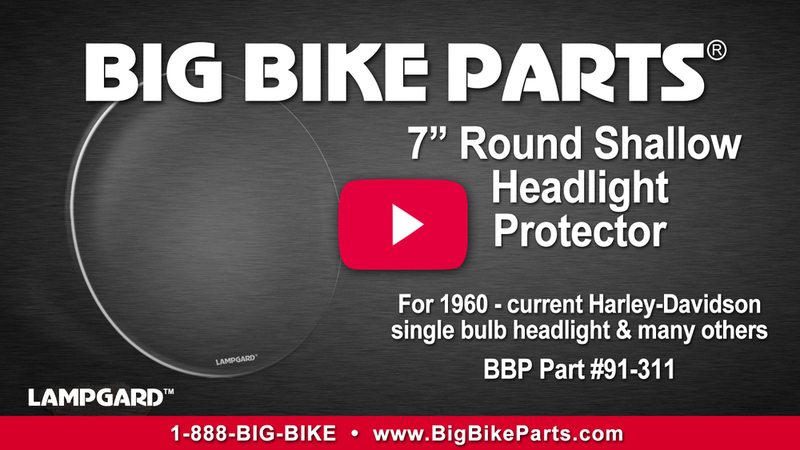 Rice Lake, WI – LampGard™ by Big Bike Parts® has been protecting headlights and fog lights from expensive damage and replacement since 1992. LampGard™ now provides universal protection to cruisers with their new 7’’ headlight protector. Made from clear acrylic, these headlight protectors can withstand a beating from stones, rocks, and other road debris without reducing headlight luminance. Fits most 7” round headlights with a shallow curve, such as used on: 1960-2015 Harleys; Yamaha V-stars, Road Star, Royal Star; Honda VT600, VT750, VT1100; Kawasaki VN 900, VN1500; and Suzuki VL 800, VL 1500, C50, C90, with a single bulb. Made in the USA.